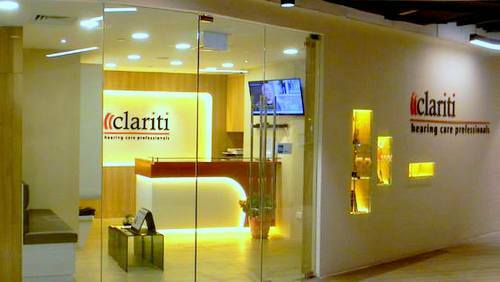 Hearing aid retailer Clariti operates within Singapore’s The Centrepoint shopping centre, at 176 Orchard Road. Established in 1997 by Ronald Pang, Clariti offers products and services with a focus on the improvement of their customers’ quality of life through better hearing. The company offers only the finest hearing aid brands, which utilize the latest technologies that take care of things like background noises and dynamic listening environment. Clariti has a preferred partnership status with three premium hearing aid brands, Siemens, Phonak, and ReSound. These brands are known for creating some of the smallest, smartest, and most comfortable hearing aids in the marketplace. The range of available hearing aids covers more than 100 models of varying technological features, sizes, and brands, available in many different styles. To provide the best solution to their customers, each hearing aid is professionally prescribed, programmed accurately, and allowed a period of acclimatisation (with complete after-care services) to ensure the highest satisfaction. Among the customer decisions is which size to fit, which greatly depends on the customer’s hearing loss profile, shape of ears, and the discreet needs of the customer. Picking the wrong size may affect the performance of the hearing aid as well as the customer’s comfort. The official Clariti – Hearing Care Professionals Facebook brand page is available at www.facebook.com/ClaritiHearing. Clariti’s Facebook page is a great resource for information related to hearing loss and hearing aids, the company’s promotional offers and events, plus much more.